10 Best Small & Mid Cap Stocks for 2016 is Released! 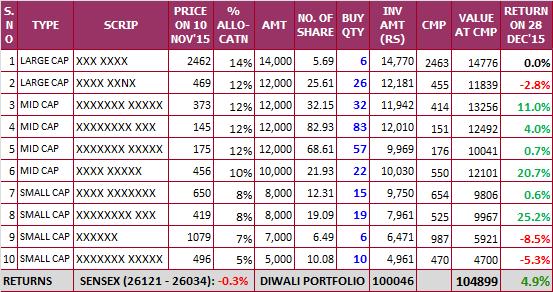 We are pleased to inform you that we have released portfolio of 10 small & mid cap stocks for 2016 on 1st Jan'16 and shared it with all our paid subscribers of Hidden Gems, Value Picks and Wealth-Builder few hours back. We are confident that these carefully selected stocks can outperform major indices like Sensex, Nifty, BSE Mid Cap and BSE Small Cap. We also take this opportunity to share the performance update of our recently released Diwali Muhurat Portfolio (released on 10th Nov'15) which is outperforming Sensex by 5.2%. Since 10th Nov'15, Sensex has given negative returns of -0.3% (26,121 to 26,034), where as during the same period, Diwali Muhurat Portfolio has given absolute returns of 4.9%. If you missed the opportunity, you can choose to receive portfolio of 10 small & mid cap stocks for 2016 released on 1st Jan'16 by subscribing to our services. Of course, we are no match for Warren Buffett and we do not have his conviction levels. So, we’ll stick to 10 stocks to begin with, which means that from 6% to 12% of the wealth will be invested in each stock. Saral Gyan Portfolio of 10 Stocks for 2016 has already been emailed to all our Hidden Gems, Value Picks and Wealth-Builder members late night yesterday. Portfolio stocks holding period is minimum of one year.